We’re getting ready to kick off another season at the Farmer’s Market. 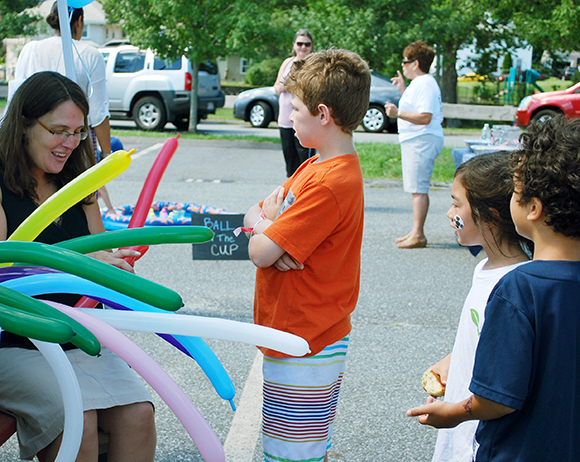 Opening Day is this Sunday, June 10th on the Swampscott Town Hall lawn. We’ll have live music along with a kids craft table. What you’ll find at the market this weekend: Produce, Eggs, Poultry, Meat, Cheese, Wine, Baked Goods, Coffee, Pasta, Fish, Spices, Flowers & Pet Food. We will also have a knife sharpener along with a variety of talented crafters. The weather looks beautiful, we can’t wait to see you there! The crocuses are starting to bloom and the smell of spring is in the air! 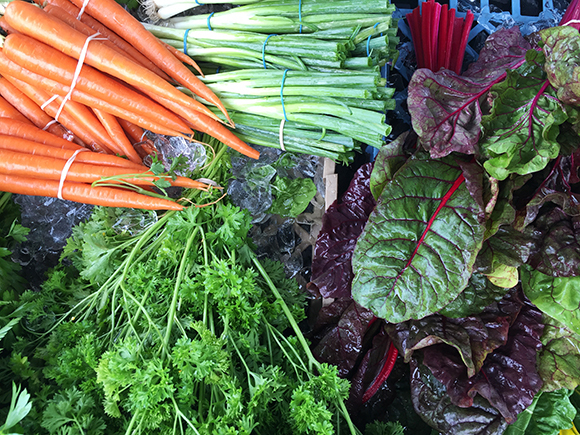 The Farmer’s Market team is starting to gear up for the 2016 market season. We’re looking to add more community volunteers to the committee this year if you’re interested in getting involved and helping us run and continue to grow this vibrant market. You can be involved as much or as little as you’d like, we are always happy to add new members to the planning committee but we’re also looking for volunteers to work a few markets throughout the summer. It’s a great way to get involved and give back to the community! Our first meeting will be March 28th, please send us a quick note if you’re interested and we’ll send you more information on the time & location. Where are our loyal patrons? We want to take this time to sit down with you, our market patrons and have a heart-to-heart. Unfortunately we have noticed a dramatic decline in market customers this year and we want to get feedback from everyone as to why this may be happening. We have a loyal group of volunteers who come out to work every week and take time out of their schedule throughout the year to grow the market and provide this service to the community so it breaks our hearts to see this. We have had feedback in the past that we need more produce vendors so we listened and we now have 4 large farms that come and provide an abundant selection of fruits, vegetables, plants & herbs in addition to all of our other great vendors providing goodies like cold brew coffee, maple syrup, baked goods, eggs, meat, pickles, salsa, spices, snacks, fresh fish and crafts. If the vendors don’t have the patrons to support their business and the travel to the market, we are going to lose them and along with it this vibrant market we have built. SO, we are reaching out to you for your help. We need you to come out and support the vendors and spread the word so that your friends and families come out as well. In addition to supporting the market, we are looking for your feedback. Why are you not making it to the market this year? Is there something more you’d like to see? Are we missing something? Do you just need reminders? Will signs throughout town on Sunday help bring people in? You can either comment on this post, on facebook or email us, we’re here to listen! We provide this service to enrich our community and support our local farms and businesses, we want it to thrive and grow but we can’t do that without your support! Thank you!! We are looking for volunteers from the community to help with market set up and take down on Sundays. Work would include the set up and take down of tents, flags, parking cones, etc on our market days. Times would be at 8:30 and then at 12:45. We would need you for about 45 minutes to an hour. It’s a great way to start your Sunday, talking with Farmer’s, enjoying the sunshine and getting a sneak peak at what you can buy at the market that day. The market runs until the last Sunday in October, with a final market the Sunday prior to Thanksgiving. Email swampscottfm@fastmail.fm if you are interested in helping out or fill out the contact form on our website. We can work around the days that you would be available to help out, we’re just looking for more hands! Thank you in advance for your help, the market wouldn’t be possible without the help of great community volunteers like you! Celebrating National Farmer’s Market Week! 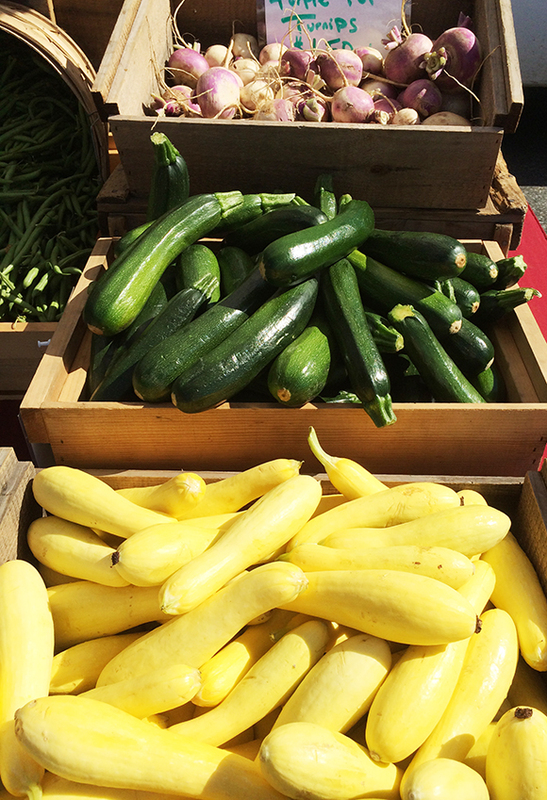 If you needed yet another reason to come out to the Swampscott Farmer’s Market this weekend, how about the start of National Farmer’s Market week? 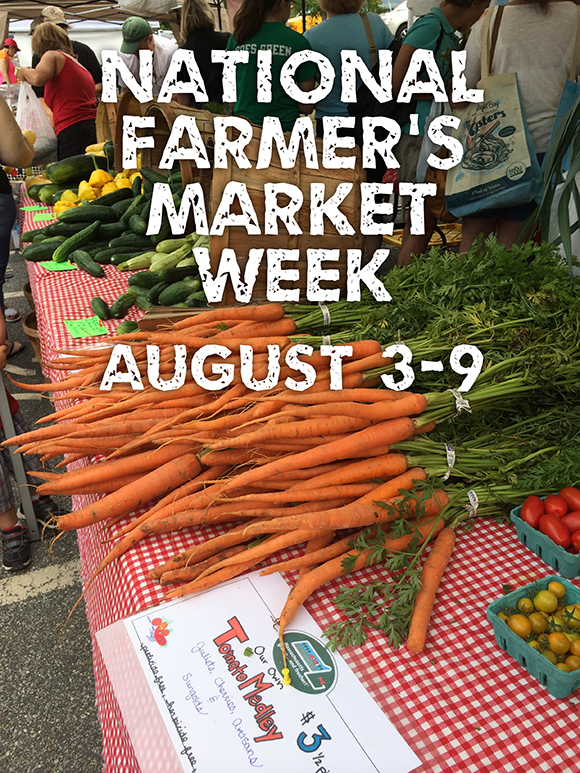 August 3rd – 9th has been declared National Farmer’s Market Week! We are so happy and grateful to see the market thriving every weekend after all the hard work we put into planning! Most of all we would like to thank all of our fantastic farmer’s and vendors for helping this market grow and for helping us provide this service to the community! We love seeing all of your smiling faces every weekend,we hope you’ll be able to make it out this weekend to show our vendors how much you appreciate them and to keep this beautiful market running for years to come! The market is run by a dedicated group of volunteers and we want the market to succeed just as much as you do so we’re always open to your comments & suggestions. You can always stop by our booth on Sundays or write us a note through the “contact” section on our website. We’ll see you on Sunday!! The week has finally arrived! 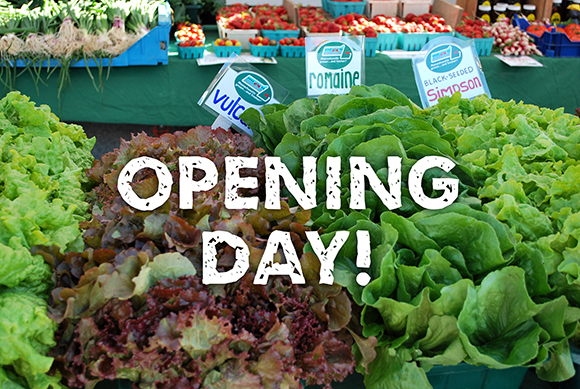 The market is opening for the season on Sunday and we couldn’t be more excited. It is still early in the growing season but we guarantee that our vendors will be bringing some great stuff! Things you can expect to see this time of year include items like lettuce, kale, strawberries, turnips, radishes, spring onions, greenhouse tomatoes, fresh herbs, rhubarb, and some beautiful plants. We have a number of fantastic vendors joining us this year, in addition to the produce, you’ll be able to find grass-fed meats, fresh seafood, honey, pickles, flowers, wine, cheese, cannolis, coffee, baked confections, candy, bread, spices, soup, prepared seafood, thai food, fresh pasta & salsa (just to name a few). For music on opening day we are pleased to have Marimbachic (Lydia Lucas) joining us. BRING THE KIDDOS! We’re going to have fun activities like balloon making and face painting along with cake (while it lasts)! Please help us spread the word by telling your friends, family and neighbors. The weather report is looking good, we hope to see everyone out there on Sunday supporting the local farmers! !